I have a confession to make: I have a Masters in Ancient History but this is the first time I’ve read The Iliad in its entirety. And now for another confession: I really didn’t like it as much as I feel I should have. I enjoy The Odyssey. Odysseus rocks and I’ve always had a major soft spot for Telemachus. 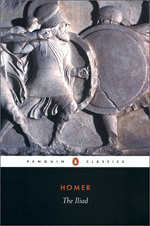 So it’s not that I have anything against Greek epic… just THIS Greek epic. I don’t know how much of it was the translation and how much was the work itself, but I just wasn’t interested most of the time. Ultimately, I think this just confirms something that I (and all those who know me) have known for years: Rome > Greece in my little corner of the Classics.